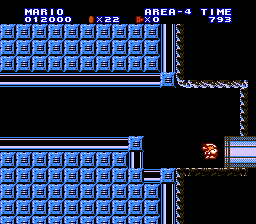 NES Extra Mario Bros. (JPN/USA) in 19:24.68 by HappyLee. However, despite his newfound ability to return to levels he's visited before and acquire upgrades that don't go away when he dies, Mario still cannot scroll to the left. This movie collects all of the keys and fights the true final boss but only collects two of the upgrades. Note: An IPS patch for the hack can be downloaded from http://tasvideos-moviefiles.googlecode.com/files/ips%2Bpatcher.zip.